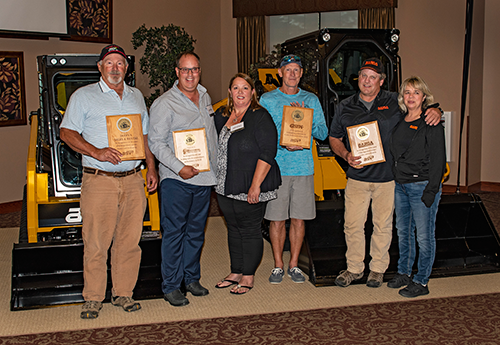 ASV Holdings, a manufacturer of all-purpose and all-season compact track loaders and skid-steers, named its 2018 dealer award winners. The awards honored top-performing and loyal members of its list of dealers at the company’s annual dealer meeting. The Greenery was named the 2018 Employee Owned Company of the Year by the Carolinas Chapter of the national Employee Stock Ownership Plan Association for effectively meeting the criteria of communicating the benefits of employee ownership as it relates to the success of the company. There are approximately 100 employee stock ownership plan (ESOP) companies that comprise the Carolinas Chapter in South Carolina and North Carolina, which is part of the national ESOP Association, based in Washington, D.C. An ESOP is an employee-owner program that provides a company’s workforce with an ownership interest in the company. The company celebrates this achievement while also celebrating its 46th anniversary in February and its 11th anniversary as an employed-owned company. Heritage Landscape Supply Group, a new wholly owned subsidiary formed by SRS Distribution (SRS), acquired CPS Distributors (CPS) and Automatic Supply. Terms of the transactions were not disclosed. Headquartered in Westminster, Colo., and founded in 1890, CPS is one of the largest wholesale distributors of irrigation and landscape supplies in the Rocky Mountain region. CPS serves landscape and irrigation contractors, municipalities, pump and well contractors and other professional contractors through a 13-branch network across Colorado and Wyoming. Headquartered in Fishers, Ind., and founded in 1982, Automatic Supply distributes landscaping, irrigation, outdoor lighting and related products throughout the state of Indiana. Automatic Supply serves a diverse group of professional landscape, irrigation and outdoor lighting contractors through its network of four branches. To ensure continuity and consistency for customers, employees and supplier partners, management of CPS and Automatic Suppy will remain in place. Lowell Kaufhold, president of CPS, and Steve Christie, president of Automatic Supply, will remain actively involved, be co-investors and join forces together as “founding fathers” of the new Heritage platform, helping to guide the company’s strategy.